Rebasing in Git is a very useful feature which helps to maintain a readable commit history. Interactive mode of the rebasing is one of the most powerful tools which Git provides. In this post I am going to present interactive rebase and show how you can leverage it in daily work with your repository. Let’s start with a very quick overview of Git rebase in its most-common, non-interactive mode. Of course, rebase rewrites the branch history, so we have to be careful if the branch is used by other team members. Such changes must be coordinated with everyone who works on the branch. What is more, sometimes there is an additional big challenge related with Git rebase. It comes from the fact that merge conflicts may occur multiple times, as we move changes one by one. Sometimes it might lead to a serious effort. In such cases I would recommend to fallback to a merge. Now, once we covered the regular rebase, comes the time for the advanced approach. What would happen if we selected an older commit on the same branch as our rebase point? Nothing interesting yet. If we add -i option for our rebase command, though, we can tell Git to do something more than just reapplying these commits. Let’s take a closer look at the available options. What can we do while reapplying commits? These options are very powerful but in most cases they change the history of the branch. This is not a big deal if the branch was not pushed to any remote repository yet. If it was, though, then we can push it only with --force flag, as it might affect the work of other team members who use the same branch. Be careful! As we can see, with interactive rebase it is possible to revert changes and clean up the commit history. In my opinion it is a good approach to make commits as often as possible while working on a feature or during a refactoring. It gives us multiple checkpoints in the history, which is useful when we are in the middle of big changes. Then, before pushing to a remote repository, we can use interactive rebase to review the commit history and improve it if needed. This might often include squashing multiple commits into a single one to make each commit more meaningful and complete. In this article I presented Git rebase, including its interactive mode. Interactive rebase is one of the most powerful ways of managing your commit history. You can remove arbitrary commits from the branch history, amend them or meld multiple commits together. This allows you to keep your Git history clean and maintainable, which is very important for every project. I hope you found this post useful. Good luck with rebasing! 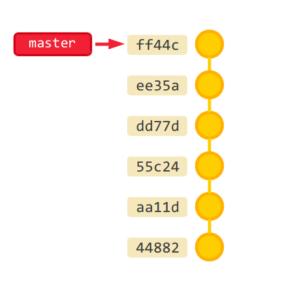 If you liked this post, then you might also like my Undoing In Git article, which is a summary of different ways of reverting changes in Git. I highly recommend it! 3 response to "The power of Git interactive rebase"
Slide shows aren’t working for me in Chrome. Thanks for the feedback. I’ve checked and they work in my Chrome though. Can you provide any details of what you are experiencing? Are they missing completely or…?